NEW YORK, New York — On May 26, a delegation of the Hayastan All-Armenian Fund, led by executive director Ara Vardanyan, officiated the opening of a large, newly rebuilt section of the Shushi Cultural Center. The extensive renovation project, the first leg of a two-phase initiative, was made possible by the financial support of the Fund’s Toronto affiliate. The opening ceremony was attended by Narine Aghabalyan, Artsakh’s minister of Culture and Youth Affairs; Kajik Khachatryan, head of the Shushi Administration; various local officials; guests; and numerous Shushi residents. The cutting of the red ribbon was performed by Mkrtich Mkrtichian, chairman of the fund’s Toronto affiliate; Ara Boyajian of the fund’s Board of Trustees; Minister Aghabalyan; and Ohan Ohannessian, one of the benefactors of the renovation project. The rebuilt section of the Shushi Cultural Center will house the Mkrtich Khandamiryan State Theater as well as a puppet theater named after world-renowned filmmaker Atom Egoyan, one of the sponsors of the renovation project and a longtime supporter of the Hayastan All-Armenian Fund. The rebuilt section will also be home to the Varanda Youth Choir and a smaller theater, and include classrooms for painting, ballet, instrumental folk music, and embroidery. “While Artsakh’s strength rests in its mountains, the strength of its people rests in its culture,” said Mkrtich Mkrtichian in his address, stressing the role of a dynamic artistic environment in the revitalization of Shushi’s venerable cultural traditions. The second phase of the Shushi Cultural Center renovation project will include the refurbishment of a 450-seat events hall and new landscaping throughout the grounds. This leg of the initiative, slated to be completed within the next few months, is being implemented with the financial support of the government of Artsakh. Following the opening ceremony, the fund’s delegation visited the Khachatur Abovyan School, which is currently undergoing a complete makeover. 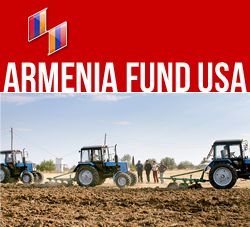 The project, made possible by funds raised at the 2011 Moscow Gala and additional support from the government of Artsakh, is nearing completion. Also to open soon are the school’s two fully furnished computer rooms, which were established through individual donations to Armenia Fund USA, the Hayastan All-Armenian Fund’s Eastern U.S. affiliate. Subsequently, accompanied by Archbishop Pargev Martirosyan, primate of the Artsakh Diocese, the delegation visited the Ghazanchetsots Cathedral as well as the Mariamyan Girls’ School, which was recently refurbished through the efforts of the government of Artsakh.